The U.S. Coast Guard is reviewing a request from a local pilots association to establish a new federal anchorage in Rockland’s outer harbor for the purpose of accommodating large cruise ships. The Penobscot Bay and River Pilots Association ― whose member captains pilot large foreign-flagged vessels into port ― says the requested anchorage in Broad Cove, located in Owls Head, would provide more safety for cruise ships entering the harbor. But some in the coastal city worry that establishing the anchorage would attract more cruise ships to Rockland, spawning congestion problems similar to what Bar Harbor is experiencing. The Coast Guard is reviewing the request, according to Cmdr. Andrew Meyers. If the Coast Guard moves to accept the request as an anchorage, the proposal would then have to go through a rigorous review process, including environmental assessments and a public comment period. It is far from a done deal. But the federal anchorage request has reignited the simmering debate over whether Rockland wants to be a cruise ship destination. The Rockland City Council is currently seeking to quantify the impacts that cruise ships have on the city, in terms of economic benefit but also on quality of life. The council is scheduled to vote Monday to request that the city’s Harbor Management Commission make recommendations to the council by mid-June on how to handle the increase of large cruise ships coming into port. The council is also seeking input from the Rockland Economic Development Advisory Committee. The city may also commission an independent study during the peak of the cruise ship season in Rockland this fall to determine the economic impacts. The Penobscot Bay and River Pilots Association submitted its request for a new federal anchorage in Broad Cove to the Coast Guard in July. Federal anchorages, which are included on nautical charts and in the Federal Register, notify vessels of where the safest place to anchor in a port is located, as reviewed and designated by the Coast Guard. Anchorages are established by the Coast Guard for a variety of reasons and can serve different purposes, Meyers said. Rockland currently has two smaller federal anchorages, however these anchorages are not ideal for larger vessels such as cruise ships. The Penobscot Bay and River Pilots Association is responsible for guiding foreign-flagged vessels into ports in Penobscot Bay, Frenchman Bay as well as the Penobscot River. The pilots are tasked with then anchoring the ships in the safest place and position. The association brought forth its request to help with voyage planning for cruise ships and to address safety issues pilots have encountered when the 900-foot plus cruise ships anchor at Rockland’s existing anchorages. While they can anchor some cruise ships in one of the smaller anchorages, it is only safe if the ships have dynamic positioning systems that prevent the chip from swinging around, Capt. David Gelinas, president of the Penobscot Bay and River Pilots Association, said. Not all ships have this technology, or choose to employ it because of the amount of fuel required, Gelinas said. With limited depth available in the smaller anchorage, a “ship must be anchored very precisely and monitored very closely to stay within the anchorage circle,” according to the request. However, since large vessels are not mandated to anchor in an established federal anchorage, the limitations of Rockland’s smaller anchorage have led pilots to anchor large cruise ships in several locations outside Rockland Harbor’s limits, including in Broad Cove. In terms of anchorage, Broad Cove “has good holding ground, with modest current,” and “gives excellent lee from the prevailing sea and swell that rolls into Penobscot Bay,” according to the written request. Having a mapped federal anchorage designated for large vessels would also help for voyage planning, when a ship is looking ahead to where it can anchor, Gelinas said. The designated anchorage would also alert other users of Rockland Harbor as to where these cruise ships will likely be when they are anchored, he said, though the ships would not be forced to anchor there. “This is what we do, if we see an opportunity to make things safer on the water, we say something. We say something to the Coast Guard,” Gelinas said. Some residents, including Rockland Mayor Valli Geiger, have raised concerns about the level of transparency surrounding the request. The pilots association did not bring the request to the attention of the city of Rockland or the town of Owls Head. Gelinas said his organization is “working within the process” set by the Coast Guard for establishing federal anchorages. Gelinas said he has spoken about the idea for a new anchorage in Broad Cove at the Maine and New Hampshire Port Safety Forum since 2014. “It’s [the Coast Guard’s] job to run it to ground and do the public outreach part of it,” he said. Meyers and two other members of the Coast Guard handling the federal anchorage request met with the Harbor Management Commission last month to discuss the process. While some members of the commission and of the public said the informal presentation cleared up some questions about the anchorage, concerns about an increase in the number of cruise ships coming to Rockland were abundant. Judith Anderson, a resident of Owls Head who lives close to Broad Cove, said at the meeting that she is worried that Rockland will become another Bar Harbor. Gelinas said that cruise ships will continue to come to Rockland regardless of whether the Coast Guard approved establishing the federal anchorage in Broad Cove. With CruiseMaine, a combined effort of the Maine Office of Tourism and the Maine Port Authority, promoting cruise ship traffic in Maine, Gelinas said the anchorage request aligns with the state’s effort to attract more cruise ships north of Portland. A concerted effort to attract cruise ships to Rockland has been underway for about a decade, according to former harbormaster and current City Councilor Ed Glaser. Large cruise ships have booked nine stops in Rockland for the 2018 season. But recently, the city moved to increase the passenger fees paid by the vessels from $8 per passenger to $10 per passenger. 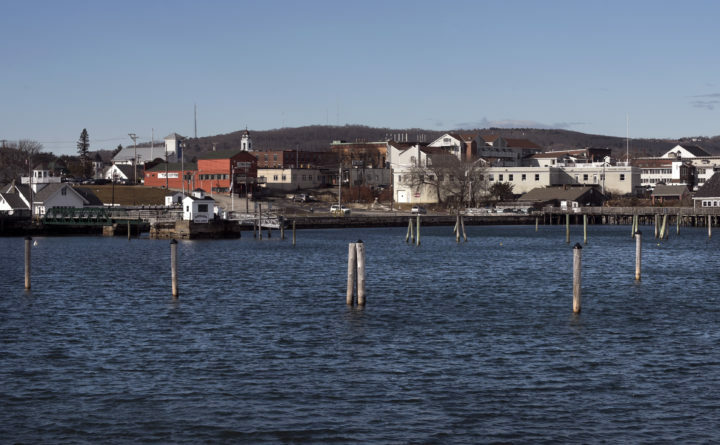 At the Feb. 20 Harbor Management Commission meeting, harbormaster Matt Ripley said there is little that the city can do to prevent a ship from anchoring inside or outside Rockland Harbor. “We have no authority whatsoever in stopping them from anchoring,” Ripley said, adding that the only way he can see for the city to cap the amount of cruise ships would be to limit the number of people coming over the city’s docks at the public landing ― where cruise ships tender their passengers. The Penobscot Bay Region Chamber of Commerce has been supportive of the cruise ships coming into Rockland due to the economic boost they provide in the fall, when the majority of cruise ships stop in the city. Meyers said within the next two months the Coast Guard will make a decision on whether to propose that the requested Broad Cove anchorage be established. It would likely be more than a year until that review process was completed.